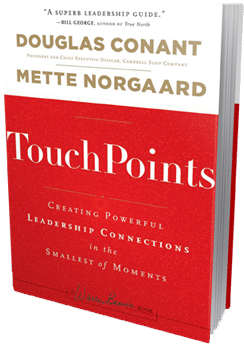 When I first saw a reference to the new book, TouchPoints by Douglas R. Conant (2011), CEO of Campbell Soup Company, I immediately thought of “Moments of Truth” by Jan Carlzon (1987), CEO of Scandinavian Airlines. I had always thought of touchpoints as being synonymous with moments of truth. Carlzon defined moments of truth as points of contact with customers. It now appears time to refine my understanding to differentiate between customer touchpoints and leadership touchpoints. Carlzon wrote of leadership strategies in the customer-driven economy; flattening the pyramid and empowering the employees, and for leaders to ensure that the overall vision of the company is achieved. Campbell writes of leadership strategies in the “interruption age”; improving employee engagement through leadership interactions. He notes that rather than managers perceiving daily interruptions as annoying, they should instead be managed as opportunities for improvement. Informal interruptions should be seen as the most powerful and long-lasting opportunity for skilled leaders to promote the organisation’s values, purpose and agenda.